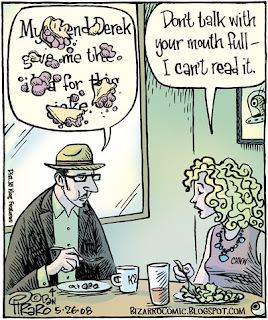 Today's Bizarro is brought to you by The Center for the Study of Hitchcock Homages. I've seen a lot of graphic caption balloon puns over the years, have even done some myself, so I tend to shy away from them. But when "my friend, Derek, gave me the idea for this joke," I liked it and decided the addition of the pie chunks made it worth doing. That's me and CHNW (note the monogram), in case you have some kind of rare vision disorder that prevents you from spotting the friggin' obvious. And yes, that's vegan pie. Duh. That's pretty cool how you gave credit in the caption, without being too obvious. That's just clever any way you look at it! to say that when I saw this comic in the paper, I spotted the "CHNW" and immediately knew what it meant and was SO PROUD OF MYSELF. I feel like I know you guys! This is just as cute as pie, and clever ta boot. i like vegan pie....mmmmmm, apple. i really dig this one; it's pie-riffic!